Since its founding in 1834 the New-Yorker Staats-Zeitung has been the principal newspaper of New York City's German-speaking community. Although the paper has long been available on microfilm, it has been little used by genealogists. In its pages, however, are thousands of marriage and death notices which give such vital information as places of origin in Europe, married women's maiden names, and names of relatives. The earliest surviving issues of the Staats-Zeitung, between 1836 and 1870, contain some 10,600 death notices, 1,500 marriage notices, and 50 birth notices. Frank Biebel has indexed all these notices, the marriages by bride and groom, and the deaths by both decedents and non-decedents. He has also indexed notices from several smaller German-language papers that survive. His indexes are meticulously annotated to give the researcher some idea of the information each notice may contain. 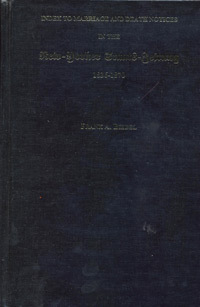 In addition to the indexes and instructions for their use, this book contains biographical sketches of the clergymen who performed the marriages, and a special section on the history of the German Reformed Church in New York City from the mid-19th century, revising previous accounts. Most of the marriages published by the Staats-Zeitung were Protestant, but there are death notices for persons from all the religious faiths of the German community. Many notices also mention persons living outside New York and vicinity.